Last weekend I had the wonderful opportunity to attend the New York City Wine and Food Festival, compliments of ShopRite. I've attended the past four festivals with support from ShopRite and I've contributed to ShopRite Potluck blog since 2010. The NYCWFF is a charity event and 100% of the net proceeds go to feeding hungry children and families in NYC and throughout the nation, via Share Our Strength. If you ever have the opportunity to attend it's great to know that the proceeds from your ticket prices are going to a great cause. This year I was accompanied by my mom and I'm so excited that she finally got to experience this event. For the past three years my husband was my +1, but this year he had a professional obligation, so mom stepped in. My mom deserved every bit of fun and excitement this past weekend. While my husband and I are out working hard all day she's at our house working hard with Max. And believe me, that 15 month-old is a lot of work! We stayed at the Hudson Hotel. 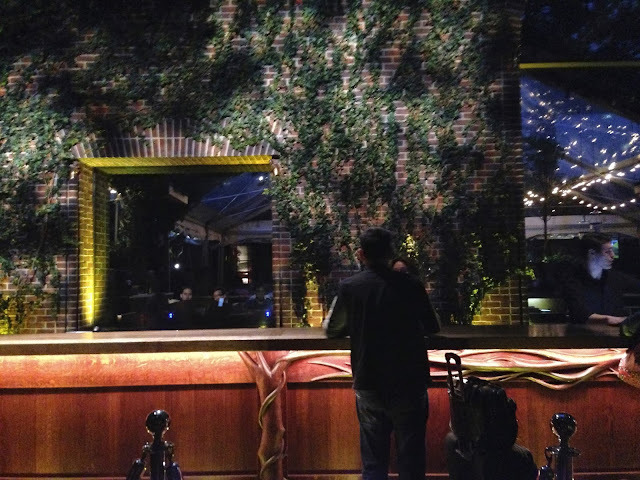 It was very boutique-ish with dark wood, dim lighting, ivy climbing the walls, neon lights. It's an interesting fusion between traditional and modern. The bar is amazing. I had one drink there Saturday night. 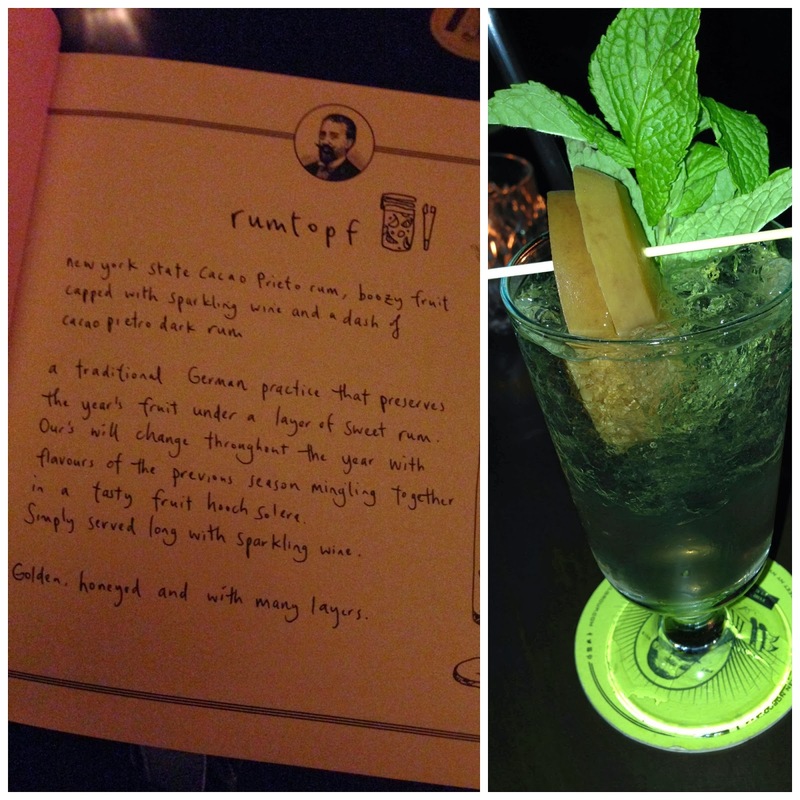 The drink menu reads like a cookbook and my rumtopf cocktail was definitely a one and done. I'd love to try to re-create it at home. 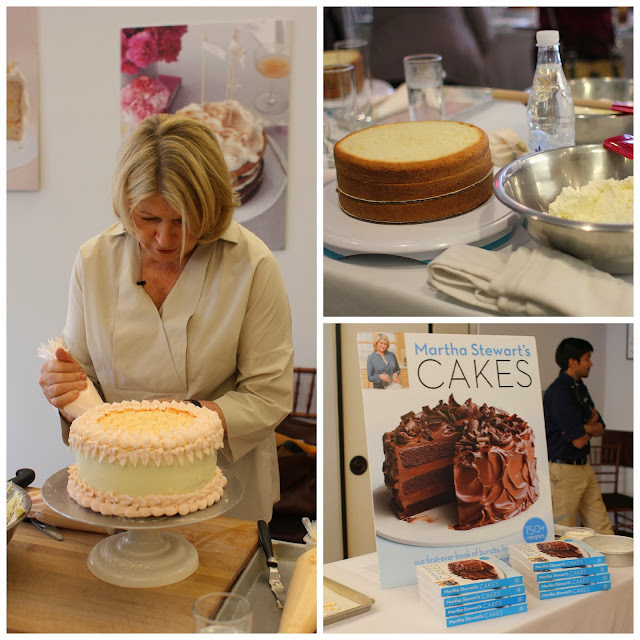 Of course most of my time was spent out enjoying the festival and my weekend got off to a fabulous start with a cake decorating class with Martha Stewart. Yes, true story. I was there and I can't believe it happened! 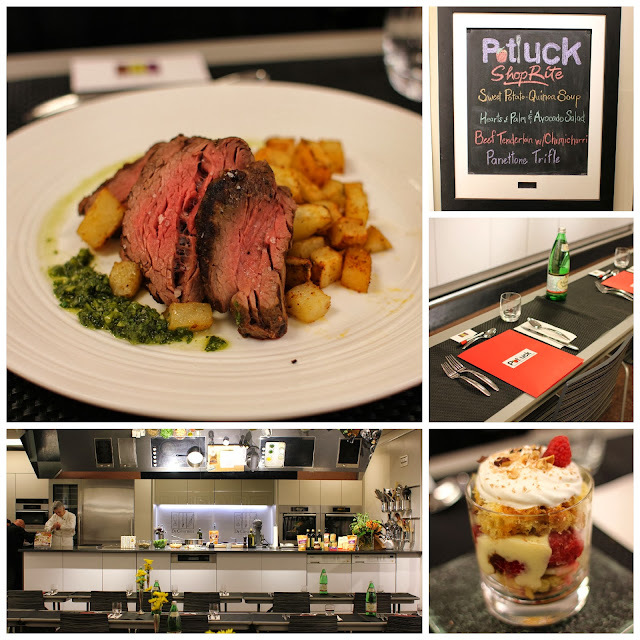 There were about 45 people in the class and it was held at the International Culinary Center. I'm still in awe of the facility, the perfect organization and structure of the class, Martha Stewart, the buttercream frosting, and Martha Stewart. Did I mention Martha Stewart? We were greeted at the door with glasses of prosecco. Martha was very warm and friendly and came around to every single member of the class to give pointers and feedback. I already had respect for her, but after this class I had even more. The class included an unexpected book signing and we all received copies of her latest book, Cakes. We also got to keep the cake decorating tools at our work station and each person left with her own decorated cake. The cake was exceptional and that buttercream was the best I've ever eaten. Here's hoping the recipe is in the book! Our next stop after Martha's class was the Grand Tasting, which is the main event for the NYCWFF. 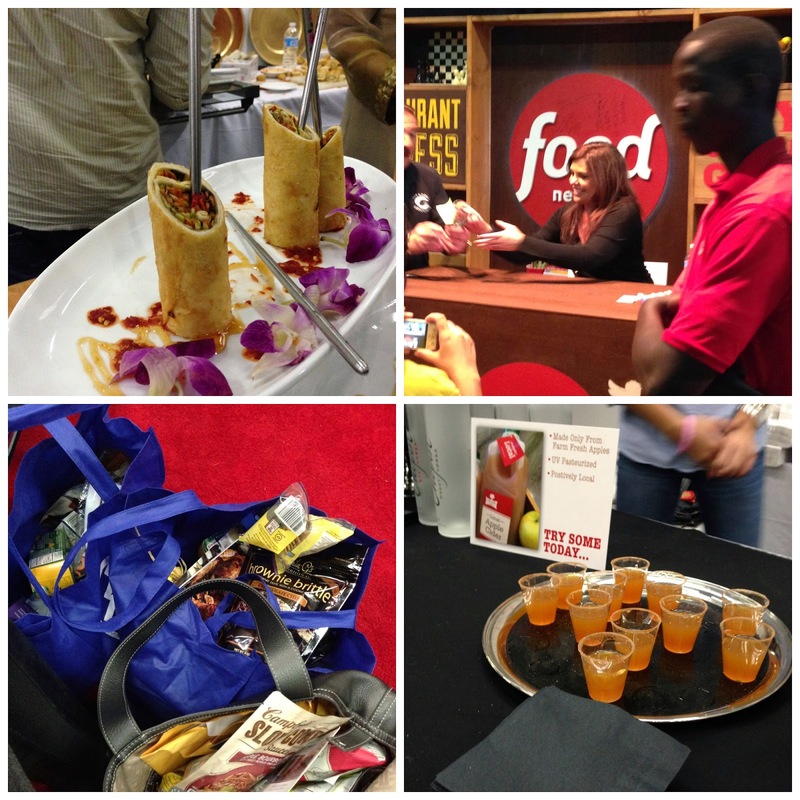 There are hundreds of food and beverage vendors and an overwhelming amount of free samples and SWAG. I spent a few hours at ShopRite's booth promoting the Potluck blog and we were busier than we've ever been! If you're a new reader that I met this weekend, welcome and thank you! My favorite food idea from the Grand tasting was the apple cider cocktail you see above in the bottom right corner. It was made from orange-infused apple cider mixed with vodka. The rim was coated in cinnamon sugar. I'm looking forward to trying that one at home. We ended Saturday with a private dinner at De Gustibus Cooking School by cookbook author Judith Choate. She was amazing, approachable, funny and so experienced. I was so impressed by her style and her skills that I'm ordering her latest book, An American Family Cooks. The entire menu featured ShopRite products, many of which we've used previously in our posts for the Potluck blog. It was great to see those ingredients shine in these gourmet dishes and I am excited to try the recipes at home. If all of this wasn't enough, I spent Sunday morning in Pasta Making 101 at Macelleria. We were able to taste a few of the chef's creations and I'll just say that I have a new appreciation for homemade pasta! ShopRite generously provided me with event tickets and hotel accommodations, but all opinions expressed in this post are my own. Oh, I would have been in heaven!! The food looks absolutely delicious and having Martha as an instructor...was icing on the cake! But most of all, you all were doing it for a GREAT cause! Btw...the pizza on your header "had me" from the beginning, lol! Stopping by from "BLM"...following your lovely blog now!